"Where is my son? Where is Crota, your lord, your princely god, your godly prince? Tell me no lies! I feel his absence like a hole in my stomach. Where once his tender tribute whetted burrowed mouths, now only hunger remains. Hear me, O waning stars, O tattered rags of Sky — I will stopper up this tearing gulf with vengeance." Oryx, the Taken King, born Aurash and formerly known as Auryx (meaning "Long Thought"), is the sovereign of the Osmium Throne, the God-King of the Hive, and master of the Taken. Reborn from the Darkness itself through a wicked pact, Oryx is the founder of the Hive race, alongside his sisters and fellow deities, Savathûn, the Witch-Queen and Xivu Arath, God of War, and the source of their terrible power. Of all the Hive gods, he alone holds the power to bend other races to his will. 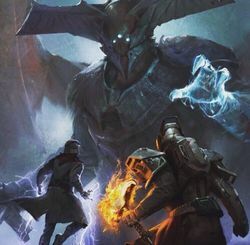 Oryx is also the father of the dreaded Crota, a deadly Hive Prince who slew thousands of Guardians during the Great Disaster, and Nokris, his estranged second-born and herald of the Worm God Xol. 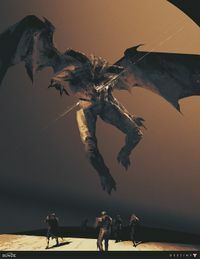 Enraged at the death of Crota, Oryx traveled to the Solar System aboard his Dreadnaught seeking revenge but was defeated twice, first in the material world and later in the Ascendant Realm, ending the threat he posed to the Solar System. "I am Aurash, first daughter of the dead king. I will chase my father’s last screamed warning. I will know what changed the motion of our moons. If the end of the world is coming, I will understand why. On my center eye I swear it. I will understand." Oryx, the Taken King traces his origins to a gas giant named Fundament, where the proto-Hive eked out a harsh existence on floating "continents" comprised of the shards of their shattered homeworld. Oryx was born as Aurash, a proto-Hive female and one of three surviving daughters of the Osmium King, ruler of the continent called the Osmium Court. Aurash's sisters were Xi Ro and Sathona, who together made up the final brood sired by the Osmium King. When the Osmium King was ten years old, a lifetime to the proto-Hive, he succumbed to senility madness, fearing an event called the Syzygy wherein Fundament's fifty-two moons would align and create a massive tidal wave that would destroy all of Fundament's civilizations. Taox, a sterile mother who served as the teacher to the King's daughters, feared the royal heirs were too weak to succeed the King and invited a rival kingdom, the Helium Drinkers of the Helium Court, to invade the Osmium Court, kill the royal family, and allow Taox to rule the Osmium Court as their regent. The Helium Drinkers invaded and slew the Osmium King, but Aurash and her sisters, two years old at the time, escaped on a ship and vowed to return one day for their revenge. After a year of traveling the sea, the sisters salvaged an ancient, high-tech ship they called "the needle" from the Shvubi Maelstrom. Xi Ro wanted to sell it at the Kaharn Atoll, a gathering place of Fundament's many species, in order to raise enough money to hire a mercenary army, but Aurash wanted to take command of the ship. Sathona sided with Aurash, goaded on by a worm that their father had kept; the worm had washed up on the Osmium Court's shores and was seemingly dead, but Sathona could hear it speak. The sisters spent the next two years reactivating the ship, until Aurash decided to use it to fulfill its intended purpose: she wanted to dive to Fundament's core in the hopes of learning a secret that would prevent the Syzygy. As they descended, the sisters encountered a vast creature called the Leviathan, a disciple of the Traveler. The Leviathan warned the sisters against proceeding further, telling them that they faced a choice between the Sky and the Deep, the Light and the Darkness, the way of life and the way of death. The sisters rejected the Leviathan, unable to accept that allowing their people to suffer was the better way, and instead decided to follow the worm Sathona had saved, which urged them to continue diving. Deep within the Fundament Ocean, the sisters encountered the Worms, who drew their power from the Darkness itself: Yul, the Honest Worm, and Eir, Xol, Ur, and Akka, the Virtuous Worms. The Worm Gods claimed that they had lived and grown in Fundament's depths for millions of years, trapped by the Leviathan and the Traveler. They had called many species to Fundament, hoping one would be tenacious enough to find them. They offered Xi Ro, Sathona, and Aurash immortality if they would allow themselves to be hosts for the Worms' larvae, with the caveat that if the sisters ceased to obey their natures (Xi Ro's desire to test her strength, Sathona's cunning, Aurash's inquisitiveness), their Worms would consume them. Furthermore, the stronger the sisters became, the greater their Worms' appetites would be. The sisters accepted the pact. Xi Ro took the knight morph and became Xivu Arath; Sathona took the mother morph and became Savathûn; and Aurash took the king morph, transforming into a male and becoming Auryx, the king of the Hive. Over the following years, the siblings returned to their people and spread the Worms among them, creating the first Hive and enabling them to first liberate the Osmium Court, then drive Taox and the other fearful species of Fundament to Kaharn Atoll, and finally to build spaceships and break free of Fundament entirely. "Sometimes I wonder if I’m a nihilist. I don’t do much except break things. [...] The only way to make something good is to make something that can’t be broken. And the only way to do that is to try to break everything. I’m glad I learned that the universe runs on death. It’s more beautiful to know." As Auryx and his sisters forced an ultimatum on the remaining proto-Hive to accept the worms or perish, Auryx turned his attention to Fundament's moons, and the Ammonites there who had allied with the Traveler and gave asylum to Taox. Initially he was willing to negotiate with the Ammonites, but his sister Savathûn, under pressure from the Worms, killed Auryx as punishment. Rather than dying, Auryx's soul instead passed to his Ascendant realm, or throne world, where his soul resided until he returned to the mortal realm. Rebuked, Auryx purged what sympathy and goodwill he had left, becoming a merciless tyrant. He and his sisters warred with and killed one another on a regular basis after the defeat of the Ammonites, as part of their worship of the Sword-Logic and their attempt to become the sharpest blades in the universe, heading to their Ascendant realms when defeated. Their war of revenge against Taox had transformed into a campaign of genocide, when they slew the Ammonites and other interstellar civilizations to feed their worms. The lords of the Hive also established their Ascendant realms, with Auryx naming his the High War. During the war with the Ecumene, Auryx came to realize that the Worm had deceived him and his sisters: their Worms appetites were growing past their ability to feed with death. Meeting with his sisters in his ascendant realm, surrounded by their servants (some of which despised them for showing weakness) they despaired over their dilemma. When his sisters offered their power to help Auryx find a way to save them, Auryx killed them, then used that power to confront his patron god Akka, the Worm of Secrets. He killed Akka so that he may steal its ability to call upon the Deep and created the Tablets of Ruin, which gave him the power to Take. His transformation complete, Auryx was now Oryx, the Taken King. During the subsequent war with the Ecumene, Oryx revived Xivu Arath in an act of war, and revived Savathûn in an act of cunning. He then decreed the tithe system: each Hive would kill their enemies, take some to feed their own worm, and tithe the rest to their superior. Thralls would tithe to Acolytes, Acolytes would tithe to Knights or Wizards, the Knights and Wizards would tithe to the Ascendant Hive, those who commanded legions of warriors and earned the right to enter the Hive gods' Ascendant realms. All of this violence would eventually reach Oryx, Savathûn, and Xivu Arath, allowing their worms to feed on violence while continuing to invoke their inner natures. After destroying the Taishibethi, Oryx managed to commune directly with the Deep itself using his Tablets of Ruin. It explained to Oryx that the Sword Logic was not death for the sake of death, but to create the ultimate form of life that would be able to survive anything in the universe. However, while he was speaking to the Deep, Savathûn and Xivu Arath conspired to maroon him in its realm, cut off his flow of tribute, and steal his Tablets. Wandering within the Deep, and fearing that he was becoming a nihilist, Oryx eventually decided to sire his own spawn. After fighting his way back into realspace and defeating his sisters, the results of this were Crota, Son of Oryx, and the Deathsinger twins, Ir Anûk and Ir Halak. Unknown to most, Oryx had another son, named Nokris, but unlike Crota, he was physically weak in comparison. While Nokris honed his mind, learned powerful magics and hoarded knowledge, Oryx disfavored him incredibly. Ultimately, Nokris sought to prove himself by speaking to the Worm Gods the same way Oryx himself did. While most of the Worm Gods rejected Nokris, the disfavored son managed to forge a pact with Xol, Will of the Thousands. Nokris traded his heart for some of Xol's power and the secret of necromancy. Oryx soon learned about his son's activities and was utterly furious. Nokris's actions were sacrilege, and necromancy was a heretical violation of the Sword Logic. For his crimes, the King of the Hive exiled him and removed all references of his disowned son from the World's Grave, the Books of Sorrow and most of his own memories. Only a statue remained as the only reference to his forgotten son. One day, the Deathsingers were refining their Deathsongs and came up with the idea of the Oversoul. Intrigued, Oryx commanded Crota to watch his sisters, so that he might learn something. However, while Oryx was off studying the Deep, Crota was deceived by Savathûn into using his Cleaver to cut a portal in the High War, allowing the Vex to enter. For one hundred years the children of Oryx waged war with the Vex, who quickly deduced the Sword-Logic and worship of the Deep as key to attaining power in the High War. However, while the Hive were able to overpower the Vex, they were unable to push them out, as they lost too much of their power when entering the Vex conflux. The situation become so severe that the Worm Eir Itself demanded that Oryx return and end the war. Quickly returning to the High War, Oryx used his powers to take the Vex and clear his throne world. Angered at his son's imperfection, Oryx threw Crota into the Vex gate network, decreeing that he return "victorious or die forgotten". At first, Crota resented his father for his seeming abandonment, but after time came to understand his father and built temples to Oryx and the Deep, eventually becoming a vital link in Oryx's tithe of death and achieving godhood himself. However, Oryx recognized that the threat of the Vex invading his throne world could not happen again, so he moved the High War into a mighty Dreadnaught scrimshawed from the remains of Akka. 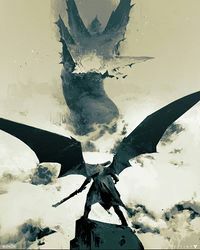 During the Hive's campaign against the Harmony and the Vex, Quria, Blade Transform presented Oryx with a simulation of his former self, Aurash. Oryx looked upon the simulation with amusement, while Aurash looked upon Oryx in horror, demanding to know what he had done to her sisters and her people. In the end, Oryx Took Quria, and presented the Vex and its simulation to Savathûn. When she asked him what proof they had that what they were doing was right, Oryx simply replied that the Hive's existence was proof enough in their convictions to live eternal by the Sword-Logic. Following the war with the Harmony, Savathûn decided that her fleets would enter the black hole that the Harmony lived around, claiming that they would become stronger for it, while Xivu Arath took her fleets away from Oryx's as she felt he constrained her too much. "What Crota began, I complete. My will... conquers all!" The exact nature of Oryx was once unknown to the Guardians, but the name Oryx appeared often enough in Hive rituals that it could not be ignored. Shrines dedicated to Oryx, used by the Hive to communicate with Oryx across the universe, were known to exist throughout the Solar System. Osiris studied the Hive extensively and foretold that the Spawn of Crota would one day pave the way for Oryx's coming by "snuffing out the worlds of Light". Members of the Blood of Oryx Hive sect are thought to be the direct servants of Oryx himself, though it is speculated that he is the master of all other Hive sects as well. After learning of the death of his son, Crota, Oryx personally traveled to the Solar System aboard his Dreadnaught, accompanied by a Hive fleet and his Taken army. While staging his fleet in the rings of Saturn, Oryx and his fleet was attacked by the forces of the Reefborn Awoken, led by Queen Mara Sov and Prince Uldren Sov. An intense battle ensued as both forces seemed to be equally matched. Queen Mara and her Techeuns then summoned the Harbingers, weapons of mysterious power that plowed through Oryx's fleet but was unable to damage the Dreadnaught. Oryx activated his Oversoul in return and unleashed a massive wave of energy that not only destroyed the Awoken fleet but also his own, and created a massive hole within Saturn's rings. Now with his forces stalled above Saturn, Oryx was forced to stand down his invasion of the Inner System, and therefore unleashed his Taken to regain his lost advantage. Oryx Battles with the Guardians. At some point after the battle of Saturn, Oryx Took the remaining Techeuns from the battle, and lead his Taken to invade the Dreaming City that they inadvertently opened for him; his very presence caused a Taken corruption that warped the Awoken homeland in-between their reality and the Ascendant realm. There he discovered Riven of a Thousand Voices, last of the known wish-granting Ahamkara that Mara Sov hid away. Oryx offered to Take Riven away; Riven, eager to try bargaining with a king, told Oryx to take whatever he wished, as long as he wished. Oryx's forces first attacked Cabal bases on Phobos and Mars. Cabal detachments were devastated within hours, with the Sand Eaters suffering a catastrophic 58% casualties, while the Blind Legion and the Dust Giants lost 35% and 39% of their numbers respectively. The Vanguard discovered Oryx's presence after sending a Guardian to Phobos to investigate a Cabal distress signal, by which time Taken covens began appearing on multiple worlds, ushering in the Taken War. Oryx was nearly beaten when the Guardian breached his sanctum and attacked him, but like all Hive Gods, this was only a temporary setback. Using his Taken powers he retreated into the Ascendant realm to recuperate from his injuries. Meanwhile, his Taken, lead by his Echoes, continued to harass the system. Once the blights had been removed, the Guardians turned their attention on Oryx and his Hive and Taken champions. By overthrowing the Court of Oryx and killing his minions, they were able to invade deeper into the Dreadnaught. After killing his closest allies like the Warpriest and Golgoroth, including his own daughters, Oryx returns to fight the Guardians once more, this time willing himself into a giant version of his physical self. Here he attempted to pull the Guardians into the Darkness and Take them, but they were able to use Oryx's own captured Light against him. By slaying his light-eater Ogres and then detonating the Light they left behind, Oryx was finally defeated. "The [King] despaired in his final moments. Rightly so. His vengeance denied." Though his petrified body was left adrift in orbit around Saturn, Oryx's Ravenous Heart however remained. Eris used his heart to construct a weapon, the Touch of Malice. Ironically, in accordance to the Books of Sorrow, Oryx intended this, as it would be his final means of maintaining his immortality through the continued use of his Ravenous Heart to feed, as well as mantling the one who vanquished him as his successor to the Osmium Throne. He only suceeded in one of these goals, however, as despite cheating death, the one who defeated him, the Guardian, would not take Oryx's throne. Known as The First Navigator in life, Oryx's defeat would leave the Hive and the Taken leaderless within the Solar System, but unfortunately they were still enough of a threat that the Guardians continued to fight them. The Taken in particular, languished without their master's power and continued to decay unless someone took Oryx's place. Two individuals in particular would attempt to assume Oryx's throne, Alak-Hul, the Darkblade and Malok, Pride of Oryx. However, both were quickly killed by the same Guardians who defeated Oryx before either could take up the mantle of the Taken King. A third individual, Noru'usk, Servant of Oryx, attempted to flee the Prison of Elders but was slain by a Guardian fireteam before he could assume the throne. Even by the time of the Red War, the Taken continued to haunt the System, primarily on Earth and Io, and it appears that Oryx's sister, Savathûn, has not only taken command of Hive broods on Titan but is also attempting to seize control of the Taken. After the end of the Red War and the reawakening of the Traveler, in the frozen ice caps of Mars, the Worm God Xol awakens to destroy the Warmind core of Rasputin. Leading Xol's army is Oryx's lost and disowned son, Nokris. However, like Crota and Oryx, Nokris would fail against the Guardians and Xol followed shortly after. However Xol would find a way to cheat death by transforming into the Whisper of the Worm using the Anthem Anatheme, in a similar vein to the Oryx. At a later date, during the chaos that engulfed the Reef, Savathûn gained a new and powerful ally in the Ahamkara Oryx took during the beginning of the Taken War, Riven. It is implied that his defeat was due in some way to his previous bargain with Riven. Nonetheless, without a master, Riven was aimless until the Witch-Queen encouraged the wish-making creature to serve her, allowing her to be closer to gaining full control over the Taken. Though Riven would ultimately fall to the same Warrior of Light that defeated Oryx, her physical death would allow the Dreaming City to be Taken. However, Oryx's youngest sister, Xivu Arath, the Hive God of War, has also begun a campaign to assume lordship over the Hive and Taken. This will likely lead to a feud between the Hive God sisters over who will be the new lord and master over the Hive species and the Taken. Other potential members of Oryx's family include the three Taken Wizards Mysik, Daughter of Oryx, Zyrak, Daughter of Oryx, and Thyshik, Matron of Oryx as well as Urrox, Flame Prince, who is described as the Scion of Oryx. None of these are mentioned in the Books of Sorrow, however, and "Daughter of Oryx", "Matron of Oryx", and "Scion of Oryx" may only be titles. "Oryx is the wielder and the servant of a terrible truth. He has predicated Himself on it, He has pursued across thousands of cairn worlds His quest to embody it, and you have seen the force of that truth expended to create these Taken. He is not a simple thing to kill." Oryx himself appears in Regicide. He fires Darkness Blasts, attacks with his sword, summons Taken, and can cause fire damage over a specific area. Another ability is Grasp of the King, where Oryx drains the player's Super meter; if the player does not shoot at and interrupt Oryx, Grasp of the King will end in another ability called King's Decree, which causes instant death. After Oryx's health is reduced significantly, he will transport the player into a Darkness dimension, a small area surrounded by an impenetrable wall of mist. Oryx will periodically emerge from the mist and swing his sword at the player, which is the only time when he is vulnerable to damage. Oryx appears once more as the final boss in King's Fall, the raid included with The Taken King. In the Ascendant realm, he is in his true form, a gigantic monster who can crush Guardians with his fists. He will also cast a number of spells such as Doxology, which kills players without the Aura of Immortality acquired from the Vessel of Oryx, or drag players into a Darkness dimension (a Darkness Sphere that disables recovery) to confront a Shade of Oryx. In addition to Light-Eater Ogres, Light-Eater Knights will spawn in an attempt to consume the blight bombs that the Ogres leave behind when killed. The best strategy is to damage the Ogres, kill the Knights, and then go back to killing the Ogres so that you have blight bombs to detonate when damaging Oryx. The challenge for the Oryx encounter is that all sixteen blight bombs must be detonated simultaneously to deal full damage to Oryx. Therefore, you have to kill the Ogres and then save the blight bombs for the fourth damage sequence. "Light! Give your will to me!" "Infection! Your Light dies here!" "No. Gather them. I will take them all..."
"My will be done! Vengeance for Crota!" "And you... will bow... TO ME!" "You... are the last hope of the Light? I have taken entire worlds. You are not worthy to face me." "Come for me, warrior of Light. I will finish what Crota began." "At last. I will have vengeance!" "I will take your worlds as you took Crota"
"Crota fell. I will not"
"What you call Darkness is the end of your evolution!" "The Darkness is a gift! Let my will set you free!" "Your Traveler's Light cannot reach you here!" "In World the stars never shone, The worm never bred in our flesh, We lived for a day. Our teeth were too short. We were hungry for things we could not eat." The description of Oryx's coming is reminiscent of the Darkness's arrival in the Solar system. This could imply some sort of connection, as Oryx was said to have been born from The Darkness. The name Oryx might be derived from the animal genus called by the same name which consists of four large antelope species. Three of them are native to arid parts of Africa, and the fourth to the Arabian Peninsula. Oryx is the second major Hive character to speak English in-game. Crota being the first and Ecthar, Sword of Oryx being the third. Oryx's voice actor, according to Bungie, prefers to be anonymous. Oryx's form in King's Fall was the largest enemy in Destiny until Riven was released in the Forsaken DLC in the Raid, Last Wish. Oryx was apparently modeled after a moth. Possibly the final outcome of the Mothmen concept art. 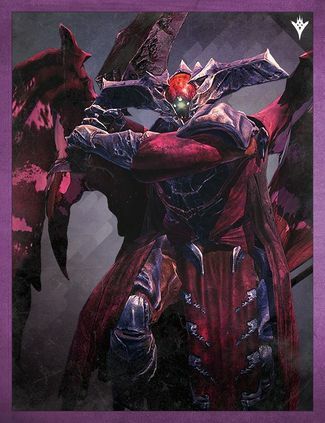 Grimoire card of Oryx, the Taken King. Oryx in his echo form. Oryx observing the battle of Saturn. Oryx as he appears in King's Fall. Notice the size comparison. Oryx holding the power to Take. Oryx in his true Ascendant form in King's Fall. Oryx in his true form.